The company specialises in security bollards and fencing, providing a wide range of barriers for all purposes. Whether you require mass safety barriers or water-filled barriers to cordon off a temporary construction site, marquee blocks to provide ballast for a larger structure or concrete barriers and kentledge blocks as part of a permanent site security system, they can help. 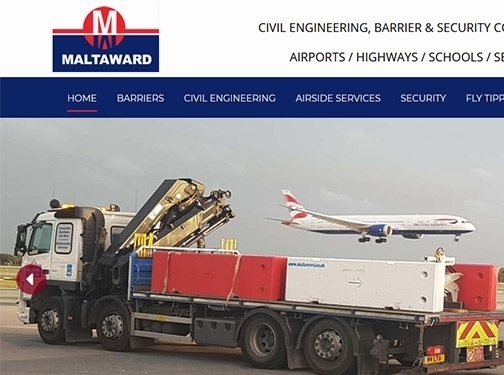 If you are looking for concrete or plastic barriers available to rent or purchase, Maltaward also offers quick, flexible delivery on their own fleet of trucks - no third-party courier services. You can also find HIAB trucks and block grabs for rental if you would prefer to install your barrier system yourself. Call today for more information on 0800 043 2742. UK (Faygate Horsham, West Sussex) based business - established in 1981 - providing civil engineering related products and services. Website includes details of products and services provided, work examples, accreditations gained, testimonials, associations belonged to, full contact details.